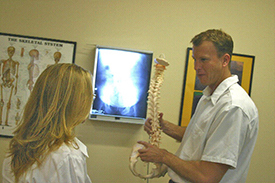 At Cactus Chiropractic, we provide the tools you need on your journey to better health. In addition to chiropractic care, we also offer remedial massage. You can find a variety of health supplements including fish oil, Vitamin D, and probiotics right in our office! We also stock other products that compliment our care such as wheatbags, pillows, PosturePoles, ice packs and Fiocreme. Which technique is right for you? Call (07) 3808 8040 today to find out how you may benefit from chiropractic!